Elevation changes from secondary to high school. Pressures intensify; classmates mature. Matiss wouldn't be left behind. See how he made a muscleman of himself. I had been kind of a nerd. I would read my comics every day, play computer games and watch YouTube videos for hours. At the same time, my friends, who played computer games like me, where bigger and stronger than me. I was also an athlete. I played football and trained karate. But in order to succeed in sports you have to be in amazing shape and strength. Whenever I would see a jacked dude walk by and all the girls would just be staring, that's what I wanted to be. I was tired of being one of the smallest kids and wanted the satisfaction that comes from successful weight training. I wanted to have something that was different than others. 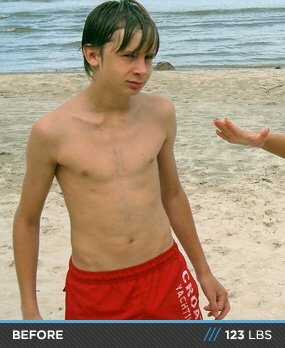 When I started secondary school, no one ever even mentioned the sport of bodybuilding. You will not find it in most secondary schools or high schools. I have always been somewhat different than other kids, just because I know what I like and what I don't like. When I started, I bought posters of bodybuilders for my room so I could look at them while I did my novice workouts. Back than I had no idea what I was doing, all I knew was that I want to be bigger and stronger. Patience and dedication! In order to achieve your goals you must be obsessed and dedicated. I started to buy Muscle & Fitness magazines. At the same time I was watching for protein and creatine drinks. Initially it was all about training. Every day I look forward to going to the gym. The gym shouldn't be something you dread to do. It should be something you can't wait to do. The gym isn't a time to hang out with your friends - it's a time to get aesthetic. I started to eat 6 times per day and tried not to eat junk food. My family helped me with motivation and getting the results. This all resulted in big changes in my life. I fell in love with the sport and the lifestyle more and more as I went along. Also when I'm in the gym, I pump reps out until I reach failure. I love the feeling after my workout, when my muscles are pumped. It took me one year to change my body from skinny to muscular. Now I'm very happy about my body. I don`t want to stop doing this, only go for better results. Is it even legal to have these sorts of guns on display at age 16? Supplements are a must for your diet. When you need to eat 4,000+ calories in one day, you're going to need mass gainers and protein drinks. Everyone's body type is different. Some gain muscle faster than others, and some gain fat faster than others. You need to experiment with different things until you finally find out what works for you. Stay focused in the gym and never get distracted. Do every rep and always go 100%! Before every workout I would do as many pushups or pull-ups as I could in 1 minute to warm up. Find a training partner who will push you beyond your limits. About training - if you don't think you can finish your set, you most likely won't. You need to believe that you can finish. Do not give up on your goals no matter how hard it is to complete them. It will all be worth it in once you get there. One thing that kept me going was results. Once you see results, you will be addicted to getting more results. Just remember to have a solid workout plan and a solid diet, than you'll be set towards making great gains!